John Wayne is a true movie star. After a slow start, Wayne atttacted the attention of all of Hollywood's great story-telling, myth-making directors. Before long, people would pay to see him in anything. Tall, gruff, and forceful, John Wayne came to symbolize the best parts of the American character — both at home and abroad. 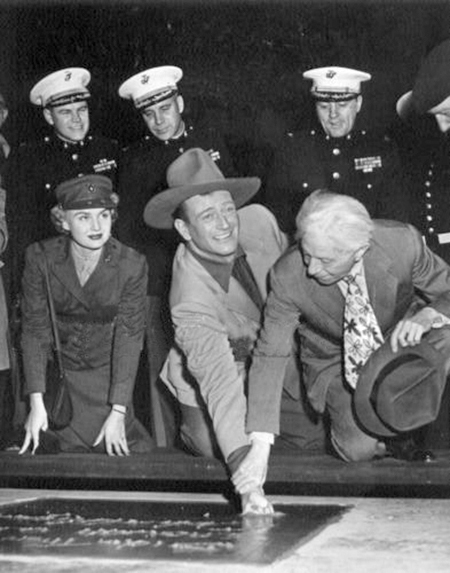 His was the last Forecourt ceremony to be hosted by Sid Grauman. Born to parents of Scottish, Irish and English heritage, the family moved from Winterset, Iowa, to Palmdale, then Glendale, California, when Marion was nine. His childhood buddy was a huge Airedale Terrier named Duke, so rather than being called Marion, people began calling him "Little Duke." Duke worked in an ice cream shop and played high school football, playing on the League Champion team in 1924. Attending USC on a football scholarship, Duke broke his collarbone while bodysurfing. This effectively ended his college days. As a favor to his football coach, who gave them tickets to games, director John Ford and star Tom Mix got Duke some work on the Fox lot. Duke's first film for Ford was as an extra in Mother Machree (released in January, 1928). He also did extra work in Noah's Ark (which played the Chinese in November, 1928). Director Raoul Walsh saw Duke moving furniture on the Fox lot one day and cast him as the lead in The Big Trail (which played the Chinese in October, 1930). 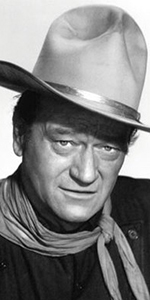 Without even asking him, the studio changed his name to John Wayne. With Big Trail underperforming, Wayne went to "B" pictureland for a time, making quickie westerns with stuntman Yakima Canutt over at Mascott and Monogram. John Ford then cast Wayne in Stagecoach (which played the Chinese in March, 1939). The film made Wayne a star — finally. Several westerns later, Ford cast Wayne in the lead role of The Long Voyage Home (released in November, 1940). Under contract to Republic Pictures now, Wayne wanted to join Ford's Signal Coprs unit in World War II, but the studio threatened him with a lawsuit if he walked out on his contract. Remorseful, Wayne arranged to tour the South Pacific theatre in 1943. Republic must have made a fortune loaning Wayne out for films like Reap the Wild Wind (released in March, 1942) at Paramount, and The Spoilers (released in June, 1942, ) at Universal, but Republic did use Wayne in some "almost 'A' pictures" like Flying Tigers (released in October, 1942), and In Old Oklahoma (released in December, 1943). Like many actors who toiled in Hollywood during the war, Wayne made several films about it: The Fighting Seabees (released in January, 1944), and Back to Bataan (released in May, 1945). Wayne reunited with returning veteran John Ford for They Were Expendable (released in December, 1945). With the war over, Wayne got his cowboy going with his turns in Fort Apache (released in March, 1948), Red River (released in September, 1948), 3 Godfathers (released in January, 1949), and She Wore a Yellow Ribbon (released in October, 1949). It was his role in Sands of Iwo Jima (which played the Chinese in January, 1950), and which served as the occasion for Wayne's Forecourt ceremony — 200 pounds of sand culled from the beach at Iwo Jima were used to make the cement — and Wayne got his first Best Actor Oscar nomination. The number of indelible Wayne films are many, but The Quiet Man (released in September, 1952), has to be considered one of his best. The High and the Mighty (released in July, 1954) was a major success. 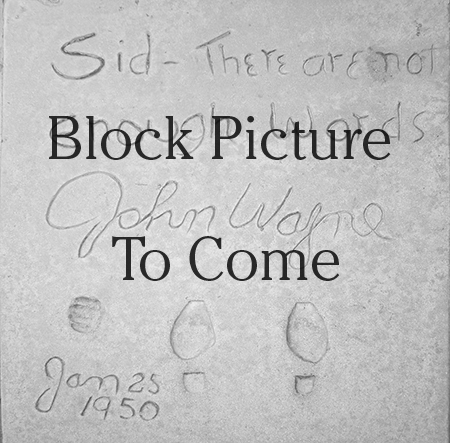 Wayne appeared in the second of a two-part episode of I Love Lucy where Lucy tries to swipe Wayne's footprint block from the Forecourt. What might be considered his finest role is The Searchers (released in May, 1956). He did The Wings of Eagles (released in February, 1957) for director John Ford, then Rio Bravo (released in April, 1959) for director Howard Hawks. Having worked with the great directors led Wayne to give it a go himself, playing Davy Crockett and directing The Alamo (released in October, 1960). Wayne was back with Ford in The Man Who Shot Liberty Valence (released in April, 1962), played General Sherman in How the West Was Won (released in February, 1963), got plenty dirty with Maureen O'Hara in McClintock! (released in November, 1963), took a supporting role in Kirk Douglas' Cast a Giant Shadow (which played the Chinese in May, 1966), and co-directed The Green Berets (released in July, 1968). A six-pack a day smoker his entire life, John Wayne was diagnosed with lung caner in 1964. He had the affected lung removed. He died of stomach cancer in June, 1979 at the age of 72. Grauman's Chinese Theatre, Hollywood, California. John Wayne Forecourt ceremony, Wednesday, January, 5, 1950. Standing, left to right: Major Gordon West, USMC, Lieutenant Colonel C. A. Youngdale, USMC, and Colonel J. O. Brauer, USMC. Front Row, left to right: Private Inga Boberg, USMC, John Wayne, and Sid Grauman.